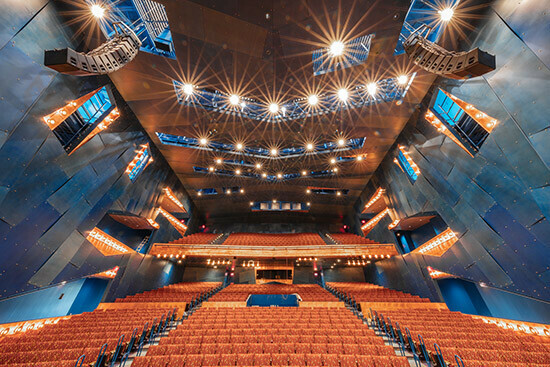 (Eau Claire, WI, September 27, 2018) – Pablo Center at the Confluence has announced that its RCU Theatre will be open to the public this Saturday, September 29 from noon until 4:00 p.m. Pablo Center is excited to share the space on this day in celebration of Downtown Eau Claire, Inc.’s International Fall Festival. The BMO Harris Box Office will also be open at this time. The community is invited to stop by to see this amazing space and all it has to offer with several upcoming shows this month. For a full calendar of events, visit www.PabloCenter.org. If you missed your chance to say goodbye to The State Theatre, the 92-year-old entertainment venue that served as a home to vaudeville, movie showings, live music, and community theater, fear not: WEAU has produced a great mini-documentary taking you through its halls and history. WEAU aired Stories of the State on Sunday, Sept. 16. WEAU’s Andrew Felix spearheaded this project, which includes photos, news clips from the venue’s reopening in 1988, video of some of the more recent performances, and interviews with a number of familiar faces within the arts community. “The opportunity to create this documentary allowed me to tell a story of the theater, the arts center and the memories of what it all meant,” Felix said. A consistent volunteer for the Eau Claire Children’s Theatre for nine years during his youth, he spent a lot of time in The State, and believed the building and the experiences made there were special. Felix is thankful for the skills and connections he developed during his involvement with The State Theatre. “Maybe producing this was my little way of giving back to the community that gave me so much,” he said. Visit Eau Claire, the area’s tourism promotion agency, has unveiled a colorful new logo (above) and brand identity that it says “captures the personality of the city known for its independent spirit, creative culture, penchant for originality, and inspiring natural resources.” The new look is already in use online, and it will be prominently displayed when Visit Eau Claire opens its new visitor center on Oct. 26 in the Pablo Center at the Confluence. Linda John, the group’s executive director, said the branding process was informed by the perceptions of residents, visitors, and people who once lived here and decided to move back. “That evaluation process consistently turned up words and phrases including independent spirit, renaissance, arts and music, a ‘forever young’ mindset especially coming into play with sports, an openness to new and original ideas, caring, collaborative, inclusive, hip neighborhoods with lots happening, and natural resources that inspire creativity,” John said. Visit Eau Claire worked with Odd Brand Strategy, an Eau Claire design firm, to create the new look. To get a peek at the new branding, go to visiteauclaire.com. The combined capacity of the RCU and Jamf theaters. 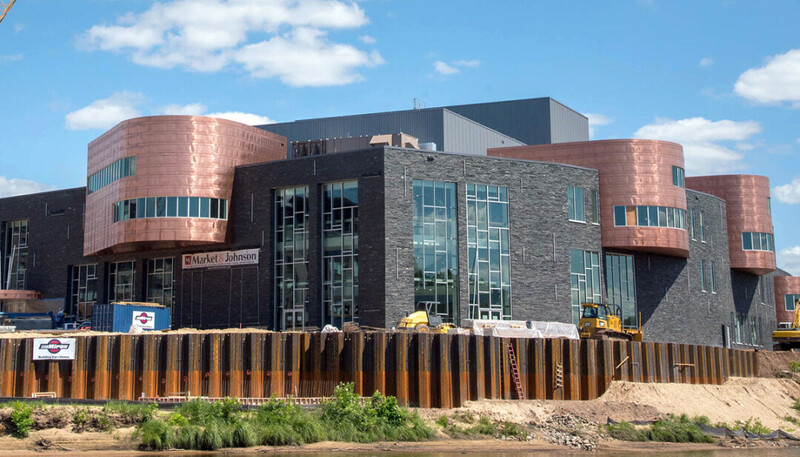 The 400-seat Jamf Theatre, the largest “black box” theater in the Midwest, will be highly flexible: The seats pull out of the wall and performances can be held on a thrust stage or in the round.The Broadway-style 1,200-seat RCU Theatre can seat more people than the old State Theatre yet no audience member will more than 80 feet from the stage. That’s the distance between the surface of the RCU Theatre stage and the fly tower, allowing a huge amount of space for curtains and set pieces to be hoisted into the air. (There’s also a distance of 83 feet from the stage to the bottom of the rigging grid, which equipment such as lights hang from.) Overall, the stage is 55 feet deep and 100 feet wide, making it three times larger than the stage at the State Theatre. The size of the lobby and atrium area – also known as the OakLeaf Physicians Lobby – which will soar upward three stories. Visitors coming from the soon-to-be-completed Haymarket Plaza will enter the arts center via this 2,200 person capacity lobby. Here they will be able to access the box office, the concession area, and view a word cloud containing the names of all 1,100 donors to the project. That’s the total price tag for the Pablo Center, including design ($6 million), construction ($45 million), furnishings ($7.9 million), and “pre-opening expenses” like staffing and technology ($900,000). The biggest chunk ($24 million and counting) is coming from donors, with the rest from the state, the City of Eau Claire, Eau Claire County, and new market tax credits. After more than six years of planning and the persistent efforts of countless leaders, supporters, and community members like yourself, the big day is finally upon us: The Pablo Center at the Confluence is a reality, and the public is invited to celebrate the grand opening of Eau Claire’s new cultural center. On Saturday, Sept. 22, from noon-5:30pm, the Pablo Center will be open for members of the public to explore and enjoy free of charge. Visitors can grab a bite to eat, explore the art galleries, and enjoy beautiful music and dance performances. When the sun goes down, be prepared to shift gears as the Pablo Center presents “Cabinet of Curiosities,” a gala event that will celebrate the idea of wonder through theatrical and musical performances. The audience will be treated to two performances. The first is the world premiere of “Terrene” (which means “of or like the Earth”), a unique combination of visual art by designer/sculptor/puppeteer Chris M. Green and music by UW-Eau Claire resident composer Chiayu Hsu, all in celebration of natural, earthly curiosities. 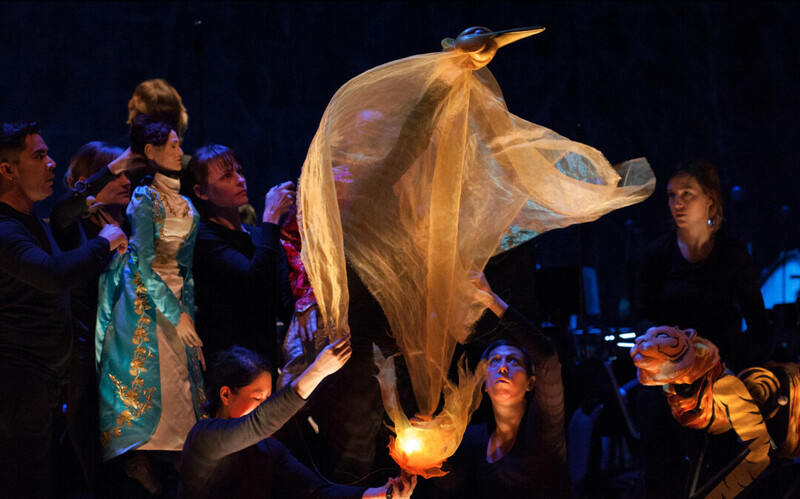 The second performance will be “Firebird,” a lush puppet and dance masterpiece that tells the tale of Prince Ivan, the magical firebird, and the epic struggle between good and evil. The Chippewa Valley Symphony Orchestra will play Igor Stravinksy’s stunning score while dancers bring David Neumann’s choreography to life. Learn more about both events at pablocenter.org/all-events. For ten days in September (21th - 30th, 2018), dozens of local restaurants will take part in an exciting new culinary tradition that gives you access to special menus, offerings, great deals, and invites you to attend a handful of unique food-themed events that raise money for community causes. It’s not easy being green, but a number of local businesses, individuals, and organizations have done it anyway, and now they’ve got awards to prove it. The City of Eau Claire’s Sustainability Advisory Committee recently bestowed its annual Sustainable Eau Claire awards, which carried the theme “Towards a Renewable Energy City.” Winners in the energy category included Xcel Energy, which currently provides a 58 percent carbon-free energy mix in the Upper Midwest; David Donovan, a longtime Xcel executive who was heavily involved in the creation of the company’s solar garden in Eau Claire; and Focus on Energy, a statewide energy conservation program. In addition, Royal Credit Union, Patty Scott, and Mark Ruddy were honored as Exceptional Natural Resources Stewards; Huebsch Services was cited in the Green Products or Practices category; Jeff Pippenger, the city’s community services director, received the award for Sustainable City Staff; and Volume One (that's us!) was honored for Environmental Education. And, in keeping with the spirit of these honors, even the award plaques themselves are earth-friendly: They’re made of wood from “upcycled” city street trees by Eco Urban Timber. Take a look at this crazy storybook which includes Justin Vernon amongst its many credits. Apparently, when he's not making music, producing albums, organizing festivals, or forming weird international music collectives, Vernon sometimes scratches up enough time to write a story to benefit children's literacy programs. 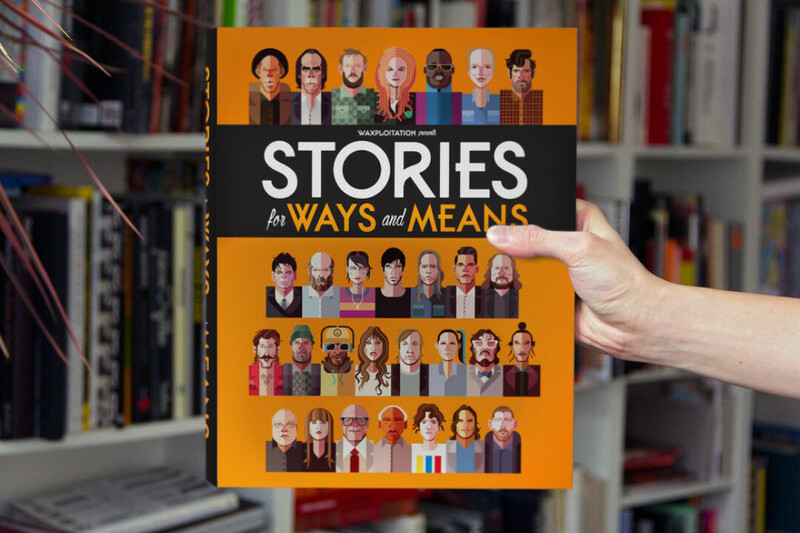 The new project, called Stories for Ways & Means, includes original work from songwriters like Tom Waits and Nick Cave (almost thirty in all). Artists were matched up to the stories, and the result is a 350-page book project. But that's not all. Some of the stories get an audio treatment with narrators like Danny Devito, Zach Galifianakis, Nick Offerman, and Lauren Lapkus. The readings are available on vinyl (duh) and you can hear some of them in a collection of trippy videos. A softcover edition of the book (which is not intended for children) runs $35 while an "exclusive signed version" would set you back $490 (those better be some sweet signatures). The vinyl LP is 20 bucks. WHAT IS STORIES FOR WAYS & MEANS? Ten years ago the founder of Waxploitation, Jeff Antebi, had an idea to ask his favorite music artists and favorite contemporary painters to come together and collaborate on original children’s stories for a benefit project. Today, 29 of those pairings make up the 350 page book project called Stories for Ways & Means. The book includes stories from Tom Waits, Nick Cave, Frank Black, Justin Vernon, Laura Marling, Devendra Banhart, Alison Mosshart and Kathleen Hanna as well as painters/illustrators like Anthony Lister, Dan Baldwin, Swoon, Will Barras, James Jean, Ronzo, Kai & Sunny, and more. Guest narrators came along for fun as featured voices in short promo films: Danny Devito, Zach Galifianakis, Nick Offerman, Phil LaMarr, King Krule, and Lauren Lapkus. IS THIS A BOOK FOR KIDS? Probably not, unless said kid is over 17 years old. It features outre art, weird images, graphic displays of nasty stuff and cuss words. WHERE CAN I PURCHASE THIS ONCE IN A LIFETIME DELUXE ART BOOK? WHERE IS THE MONEY RAISED FOR ALL THESE CHILDREN’S LITERACY PROGRAMS GOING TO GO? Proceeds from sales of the book primarily benefit Room to Read, Pencils of Promise, and 826 National among a number of non-profits working to build schools and educate children around the world. Increase in the number of crimes reported in the city of Eau Claire between 2016 and 2017, according to Uniform Crime Report statistics. Total number of crimes reported as part of the UCR statistics, including those defined as Part 1 Index crimes* and simple assaults. The last year the total number of crimes reported in Eau Claire was higher than last year. In 2004, 2,910 crimes were reported. Total drug-related arrests in 2017, a 17.1 percent increase from 2016. These include arrests for possession, delivery, and paraphernalia. Number of 911 calls received last year by the Eau Claire Communication Center, which handles all police, fire, and EMS calls in the county. Waited to long probably will go less than market wanna put money on it ?